The BimmerWorld Racing team of owner/driver James Clay of Blacksburg, Va. and co-driver and reigning ST champion, Devin Jones of Mooresville, Va., are prepared and eager to face the challenges of the 3.74-mile, 17-turn Sebring International Raceway, March 14-15 for the Alan Jay Automotive Network 120. The two-hour race is round 2 of the 2019 IMSA MICHELIN Pilot Challenge series. 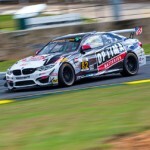 Clay and Jones will compete in the BimmerWorld Racing No. 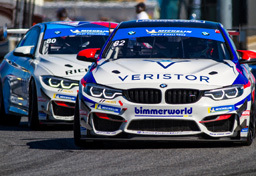 82 OPTIMA Batteries/Veristor BMW M4 GT4 in the GS class. After finishing fourth in the four-hour season opener at Daytona, they are ready for the flat but bumpy former Sebring airfield circuit that is renown for its legendary 12-hour race. Clay has competed at Sebring for over 20 years and understands the distinctions that are unique to this classic circuit. Jones has raced nearly a third fewer times and is still attempting to master the perfect lap, especially in the always challenging final turn, but he loves the test it provides and is honored to compete at this exceptional circuit. 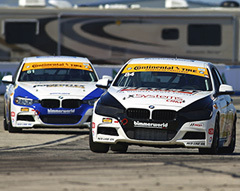 Experience is key at Sebring, and the BimmerWorld team has an abundance of that. The two-hour race format should see plenty of action as 43 cars take to the track, with 28 GS class entries expected and 15 TCR class cars in the two-class MICHELIN Pilot series. With high temperatures expected to reach the mid-80 degrees range, heat could be a compelling factor in the Florida race outcome. Thursday features two morning practice sessions, one at 8:30 a.m. for an hour and the second from 11:30-12:15. Practice three runs from 5:30-5:45 p.m. with qualifying scheduled for 6:15-6:30 p.m. for the GS class. The two-hour race starts on Friday afternoon at 12:05 p.m. All times are Eastern. The Alan Jay Automotive Network 120 race can be viewed live on Friday, March 15 from 11:55 a.m.-2:05 p.m. ET on IMSA.tv. The race will be broadcasted on Thursday, March 28, 2019, from 3:00 p.m.-5:00 p.m. EDT on NBC Sports Network. The No. 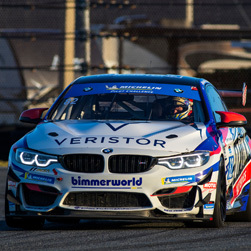 82 OPTIMA Batteries/Veristor BMW M4 GT finished 4th at Daytona in the first race of the IMSA MICHELIN Pilot Challenge series. What have you done to prepare yourself and the car for the race at Sebring? How did you and Devin get along as teammates, and what are your goals for the second race of the year? You’ve been racing at Sebring for over twenty years. How is this track unique to you, and what are some of the challenges you know you are going to face? You and Tyler Cooke had a pole position and finished on the podium in 2016 at this track. What is it going to take to do it again this year? Assess the competition for us going into this Sebring race. You and James did really well at Daytona and barely missed out on a podium spot. What have you done to prepare yourself for a podium finish at this upcoming Sebring race? This is about your seventh time to compete at the Sebring circuit. What have your previous race experiences and results prepared you for up to this point? What do you like best about the Sebring circuit? What is the most challenging? You and James co-drove together for the first time at Daytona in January. How did that go, and what are you working to improve for the second round? Sebring is a special little town. What do you like to do outside of the race track at Sebring? 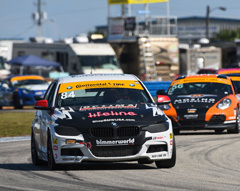 BimmerWorld Racing had strong showings in the GS and ST classes of Friday’s IMSA Continental Tire SportsCar Challenge series race at Sebring International Raceway. However, adverse circumstances in the 2-hour and 45-minute race led the Dublin, Va.-based team to finish down the order, with a fifth-place finish in ST and eleventh-place in GS. In the GS class, team owner James Clay of Blacksburg, Va. and his co-driver, Tyler Cooke of Fort Lauderdale, Fla., had an eventful race with their No. 82 OPTIMA Batteries BMW M4 GT4. Clay started seventh, topped off the fuel during a strategy stop on lap 11, and handed the car over to Cooke with 50 minutes remaining on lap 26. Cooke resumed in ninth place and was setting blistering fast laps to regain ground. He advanced several positions, but with 25 minutes remaining, the BMW and a McLaren went for the same spot of race track and made contact. Cooke was hit with a drive-through penalty that all but ended his run to another podium. In the ST class, Nick Galante of Greenfield, Mass and Devin Jones of Mooresville, NC started from the third position in the No. 81 Veristor/Legistics BMW 328i. Galante was able to nudge the F30 328i into the lead on lap 1, holding his spot for four laps. The run was short-lived, however, as the 2nd-place MINI made contact with Galante in an effort to take back the lead. Both cars spun but were able to continue. Galante was able to fight back and retake the lead four laps later. Overall, the No. 81 led a total of 14 laps through the race. Fate had other plans for the BMW though, as the car was low on fuel and the team was forced to pit for emergency fuel under a yellow flag while the pits were closed. This drew a 60-second penalty. The car made its only scheduled pit stop a few laps later when Jones took the controls. Jones had a solid and less dramatic stint, but the time deficit was too much to overcome the speed of the MINIs. “My stint was good, and I had a good start. I had a good pass on one MINI going into Turn 1, and then I got the lead from another MINI going into Turn 7, so that was good. “I had some pressure from the No. 37 MINI and out of nowhere, I got hit. It seemed like it came from very far back, so I didn’t see it coming. Luckily, our car wasn’t that damaged. It went from 100 percent to about 95 percent. The contact knocked some toe out of the rear, which may have actually helped it turn better in some of the turns. I hunted down the other ST car and regained the lead again four laps later. “Then we were running out of fuel as a yellow came out. We entered the pits when they were closed to take on an emergency five gallons of fuel which drew a penalty. “After the driver change, Devin had to come in and serve our drive-through penalty. If we had another yellow, we might have been able to fight back and have a chance to win, but it wasn’t our day. “It was an interesting race. Nick did a great job in the first stint recovering from the spin. He was able to rebound and get back in the race and was leading when he came in for fuel. “We were hoping for another caution, but even if we had one, we ended up with a sensor issue, so we were running low on power. “We made a change to the car after qualifying and were hopeful we’d addressed a small handling issue, but unfortunately, I think we made it a little bit worse. The car was still solid and able to run fast, especially in longer stints and after half the fuel load was burned. “We had a car that we knew could have finished on the podium. I was battling with several cars, and I went down the inside of the No. 69 McLaren. We both turned in for the corner, and he gave me a little less room than a car could fit. I ended up tapping him and received a penalty for it, and that kind of killed our day. It’s unfortunate for the team. The race will be shown on FOX Sports 1 on Sunday, March 25 from 10:30 a.m. to 12:30 p.m. Eastern. 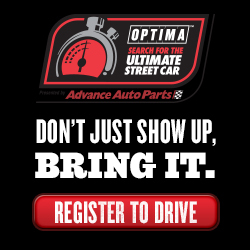 The next event is May 4-6 at the Mid-Ohio Sports Car Course. More info is available on imsa.com. 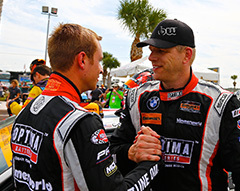 After getting off to its best start ever in the IMSA Continental Tire SportsCar Challenge series with a pole and a victory in the Street Tuner (ST) class and a second-place finish in the Grand Sport (GS) division at Daytona, BimmerWorld Racing will try to carry that momentum into the second race of the season Friday afternoon, March 16, at Sebring International Raceway in Sebring, Fla. Team owner James Clay of Blacksburg, Va. and his co-driver, Tyler Cooke of Fort Lauderdale, Fla., will drive the Dublin, Va.-based team’s GS entry, the brand-new No. 82 OPTIMA Batteries BMW M4 GT4. Nick Galante of Greenfield, Mass. and Devin Jones of Mooresville, N.C. will share the team’s ST entry, the No. 81 Veristor/Legistics BMW 328i (F30 chassis). A total of 38 cars in three classes will duke it out on the historic 17-turn, 3.74-mile road course before a partying crowd of fans enjoying their annual rites of spring. Three practice sessions will be held on Thursday, March 15 at 10 a.m., 2:05 p.m. and 5:30 p.m. The five ST cars and six Touring Cars will hold a joint qualifying session at 5:55 p.m. that day, while the 27 GS cars will qualify 20 minutes later. The Alan Jay Automotive Network 120 race will be from 2:45 p.m. through 4:45 p.m. on Friday followed by the 66th annual Mobil 1 Twelve Hours of Sebring Presented by Advance Auto Parts on Saturday. Live video coverage and live timing and scoring of the race will be offered on imsa.tv and imsa.com, respectively. The race will also air on FOX Sports 1 on Sunday, March 25 from 10:30 a.m. to 12:30 p.m. All times are Eastern. How is getting off to such a great start helping the team and its drivers? In what ways is BMW Motorsport helping you develop your new M4 GT4? You’ve developed a lot of different BMWs. What are the main strengths of your new GT4, and what are the areas that you’re working on most to improve it for the Continental Tire series? The car you ran here last year was one of the heaviest cars in the field. Where does the new M4 GT4 stack up in the GS field? Is it also one of the heaviest cars? Last year you qualified second and led every lap of the first half of the Sebring race in ST until a freak problem on the pit stop caused a long delay. Still, you were able to battle back for a sixth-place finish, just 0.035 out of a top-five. Now you’re in a brand-new car and in a different class, but you’re still fielding the ST car for Nick Galante and Devin Jones. The size of that car’s fuel tank changed last year due to the rules and its fuel economy suffered. Is that still a challenge, or has that been rectified for 2018? One of the special things about Sebring is its spring-break crowd. Do you have any favorite memories of things you’ve seen at Sebring that you can share? Last year at Sebring you started your stint from 13th place due to a refueling issue, and yet you still almost got a top-five finish. It was an intense effort. Since you’re in GS now and there are more GS cars than any other class, do you think you can do it again? Sebring is known for its bumps. Since you have a lot of experience there, do you know where most of them are and do you actively look for new bumps during practice? What is typically the bumpiest part of the track? You grew up in Cooper City, Fla., and Sebring was the site of your first victory ever in car racing. If you could talk to yourself back before that first victory here, what would you tell your younger self? Sebring has a great deal of history. What does it mean to you to be able to race on such a historic track? You and Devin were winners in your first time driving together. 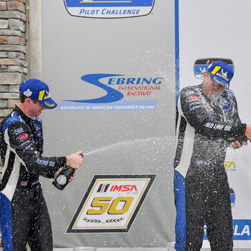 How excited does that make you for Sebring and for the year ahead? How do your individual driving styles compare? You won this race last year in ST with Spencer Pumpelly. Now you have a whole different car, a whole different team, and a whole different co-driver. What will it take to repeat? This race is half as long as the season opener. Is that good, bad, or does it matter? You and Nick were winners in your first time driving together. How excited does that make you for Sebring and for the year ahead? Do you think you can duplicate your Daytona pole at Sebring? What’s the biggest difference driving a turbocharged car than the non-turbocharged car you drove last year? Nick is a former series champion, but the season opener was your first Continental Tire SportsCar Challenge series victory. What did you do to celebrate, and now that you’ve had a little time to reflect upon it, how does it affect you going forward? “It was a huge win for me personally. My mom and dad were there, which made it really special. They supported me so much through my career in racing and to have them with me at Daytona was something I’ll never forget. The BMW aftermarket and tuning experts at BimmerWorld have a new opportunity to show the pace and progress of their turbocharged 328i models this weekend at the historic Sebring Raceway circuit. Coming off the season-opening IMSA Continental Tire Series event at Daytona International Speedway where the sister Nos. 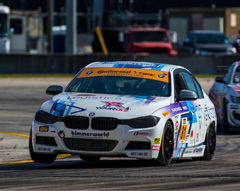 81 and 84 BimmerWorld BMWs demonstrated front-running speed, team owner/driver James Clay and his staff of technicians have found more gains with the F30 platform for Round 2 in central Florida. Teamed with Tyler Cooke in the No. 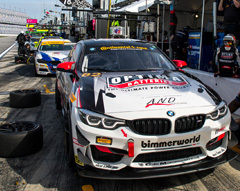 84, Clay expects the OPTIMA Batteries F30 to be fast throughout the 3.7-mile road course, and to show the BimmerWorld-built BMW’s natural capabilities in vital areas around the 17-turn facility. Clay and BimmerWorld veteran Cooke will share the track with team newcomers Jerry Kaufman and Kyle Tilley in the sister No. 81 BMW F30. The duo impressed on their debut at Daytona, although their race was somewhat short-lived after a clash between Kaufman and another car ended their day. And with Kaufman’s unexpected marriage proposal made moments before the race (his girlfriend accepted), could he have more fireworks in store for Sebring? “The biggest lesson learned from Daytona is knowing when to go for a pass and when not to,” Kaufman said. “Jumping up from 12th to fourth as quickly as I did probably gave me too much confidence in my ability to pass going into fast corners. Sometimes there is room to go two wide, and sometimes there isn’t. 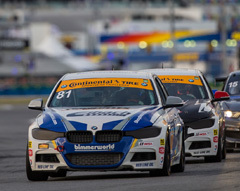 BMW aftermarket and tuning specialists BimmerWorld experienced two distinct outcomes during their visit to the legendary Sebring circuit in Central Florida for Round 2 of IMSA’s Continental Tire Series. Fast in the relatively short qualifying session, the high ambient temperature was less kind when it came time to go racing with the team’s turbocharged BMW 328i platform built on F30 architecture. Team owner/driver James Clay and Jason Briedis placed the No. 84 OPTIMA Batteries-sponsored F30 seventh on the grid, and despite running as high as third, sweltering conditions meant the tandem had to settle for ninth at the checkered flag. The No. 81 BimmerWorld F30 driven by team veteran Tyler Cooke and newcomer Andrie Hartanto lined up 13th and was running strong until being spun by a rival. With time lost as Hartanto sat stationary, the duo was left with an unrepresentative finish of 20th. With BimmerWorld’s on-track efforts paying back to its clients in the form of improved BMW performance parts and services, Clay says even a tough and hot weekend like Sebring will help the company optimize its offerings for F30 owners. Cooke: The race didn’t go how we wanted it to; Andrie did a great job running in the top-10 until getting taken out and we learned a lot during the race to help us in the races to come. Hartanto: It was an uphill battle for me, but I’ve learned that we have an amazing team. 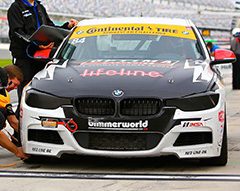 In spite of the intense heat which forced us to sacrifice power in order to go the distance, the BimmerWorld crew still delivered a car capable of a top-10 finish. I also discovered that the night before my first CTSC race is not the ideal time to showcase my marginal basketball skills; especially not with a group of highly competitive drivers and definitely not when you end up with a bruised bum, a torn-up elbow and a trip to the ER for some stitches! I realized that our race pace is very strong as we made up a lot of ground after starting from 13th on the grid. I also experienced how quickly those places can be lost when you get hit and spun around. Tyler did a great job closing out the race and ensuring that we obtained some valuable data. It was a great first race and I’m really looking forward to my home race at Monterey! Briedis: Considering we were 22nd and 23rd in average fast lap analysis during the race, gutting out a ninth-place finish shows the determination and depth of our team. The heat didn’t help our cause, but we learned a lot and hope to remedy some things before our next race in Monterey. Clay: Jason did an awesome job with qualifying and in his opening laps before heat soak set in. I was proud of my drive even though we didn’t have the power or pace to do much. Wayne’s pit call was perfect and team execution was spot on. I am super excited to take this strength of team into a weekend with more normal temperatures where we can produce the deserved result!